This brush is lathe turned and shaped by hand in the New Forest in high quality alternative horn. It has a 24 mm knot, 50 mm loft and 52 mm handle with a diameter of 39 mm. 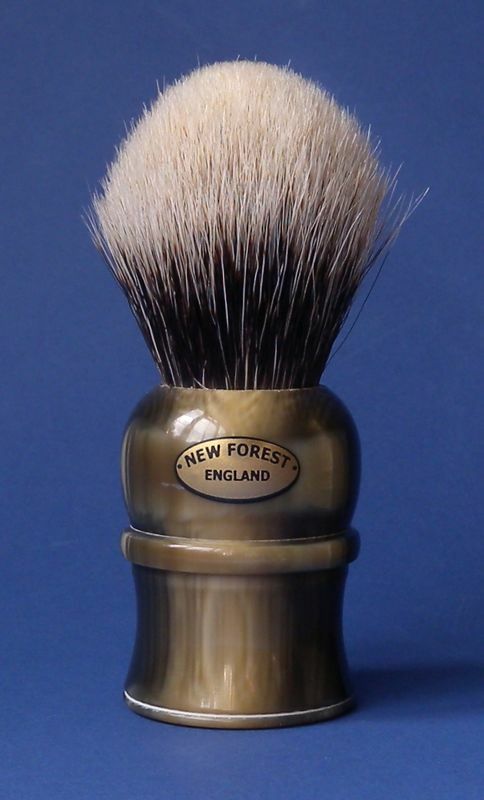 I have one of your NF2202 brushes, one of the original tambootie handled brushes and I like it a lot. How does the 24mm super badger knot compare to 22mm 2 band in the NF2202? This is what someone said about this brush: " I must say that the #2201 was a great brush, but this 24mm 2-band knot is simply phenominal. I've used it every day since I received it, and it's as good as, if not a bit better than any knot I've got. If I had to choose only one brush (God forbid) that 24mm New Forest would probably be it!" I'm pleased with it too! Got mine before yesterday. This one is definitely one of the finest brushes I own…….and there are a lot of Plissons in my collection! Wonderful quality and phenomenal lather…. Thank you for taking the trouble to provide feedback. Much appreciated. I am interested in purchasing this brush. I could tell which is the total height of the brush handle more badger hair.